How much fiber are you getting everyday? FYI, women need 25 grams and men need a whopping 38 grams! I know my husband and I haven't been getting enough, so I've been trying to sneak in a little extra into every meal. I bought a fiber supplement and have been making more beans, which are ridiculously high in fiber. I get bored of beans, though, and tired of cooking, so we have smoothies a couple nights a week. They're a great way to get your veggies and fruit and they're fun to make! This smoothie has some awesome superfoods in it and contains almost 9 grams of fiber. Drink up! 1. 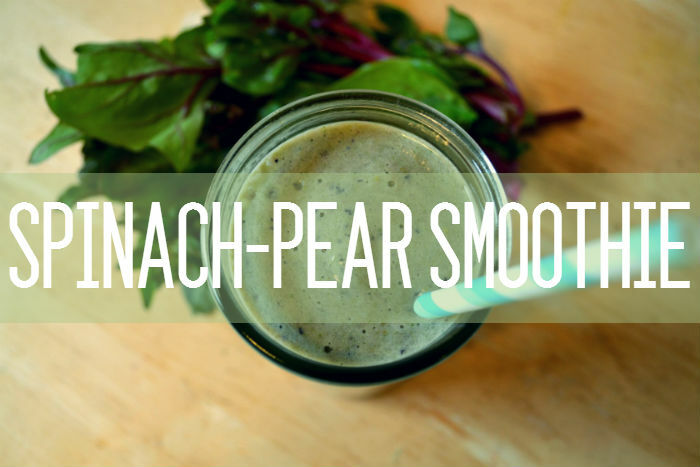 In a blender, combine the milk/juice, lemon juice and spinach leaves. Blend till smooth. 3. Add fruit, one portion at a time. 4. Throw in the remaining ingredients and blend it all up. Pour over ice and enjoy! A friend of mine has been making smoothies lately and I think I'm going to try this recipe!! It's so hard to get those veggies everyday so this is a great idea! I agree with the lovehanger- this sounds tasty!!! And excellent point about women not getting enough fiber! Way to keep women informed! Always love your posts! XO! Thanks for this recipe! I have a hand blender but I've been meaning to buy a heavy-duty one so I can make smoothies like this. Can't have too many fruits and veggies, right?